There is a talk show (Neeya Naana) in TV on every Sunday, which takes a topic weekly and discuss. It’s one of an interesting and best known show telecast in television, and last Sunday the debate was about those who want pets and those don’t want, argued with a reason. What made the show special was the debate that’s very similar to what is happening in our very home and those opposed to have pets expressed what’s in my mind and recorded their voice in our means. Whoever followed the show would truly agree that whatever kept against having pets causes a lot of trouble which much isn’t cared by the pet owners and their only wish is to have pets! Being a pet home come person, I hit the very trouble everyday from her (Maya) and not alone I; even my parents and visitors get disturbed from the prime reason as barking at everything. In case there is cat or lizard on the wall, we can’t stop her from barking until they are driven away and most of all she never shut her mouth if a child is visiting home. And because of this, no child in the apartment comes near our home and just takes the backyard route to reach their homes, which is adjacent to our block. 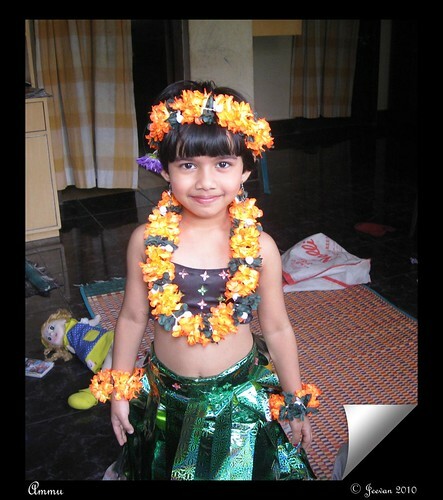 Just like everyone, I love kids and there are many kids in our apartment, and since the scare of maya we miss the joy of children at our doorstep. 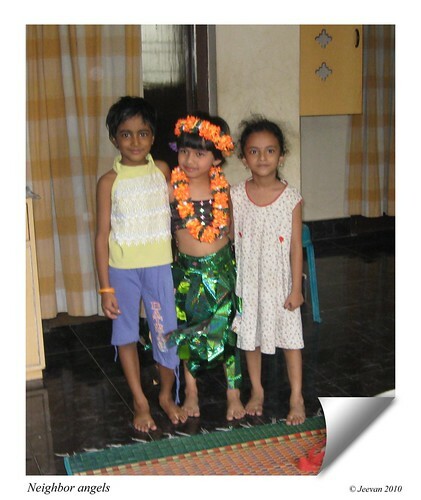 When maya was pup, all the children would gather at our home in amaze and to play with her and much before, the children used to visit our home to play with our visiting uncles kids. Except very few, no one could cross our home with no bark from her when she is tied to the gate and many of them pass in hesitation whether the dog is tied or not nor gate closed. I quite realize what we cause is a state of fear and interrupting their independence to move freely in their own apartment and creating noise. I feel so bad of the situation that I couldn’t do anything to stop this cause that create by our pet, except expressing my distress and oppose to have pet in such circumstance esp. in an apartment. The bro who brought the dog home and refused to give back and not realizing the situation, ignores the opponent and I would say the people in our apartment are very nice to not to complain about the dog and the immense noise. Just being four of us, we can’t leave the pet anywhere and it never stayed without us, esp. she needs mom and for me there isn’t a travel without both my parents and we need to think a lot before going out anywhere and the bro who is lately ignoring in taking care of the dog, adds burden to mom’s work, but he don’t want to give the pet. Sometimes I get irritate and anger because of such irresponsible people like him, where I see many in the talk show, who don’t seems like giving much importance to mans feeling and just concern at their passion and love on dogs. There were many in the show blamed the people for being scare or not liking dogs attitude. I wonder how few people could be unmindful about others feeling and only showcase their desire for dogs. Having pets might cause happiness and give satisfaction to mind and act as a close associate, but overall have a pet isn’t a easy thing and we need to sacrifice a lot in maintaining and taking care of their needs and being sure about others security . Having pets isn’t wrong and I’m never against it since having one in home, but we need a right situation to console everyone from causing crisis. For example ‘we are not in a situation to have a pet, as my parents are not capable of handling even myself, the dog has come as a burden to them and pets are something interesting, fun and loving only when we’re enough to handle the situation and relax to spend time and take care of them. 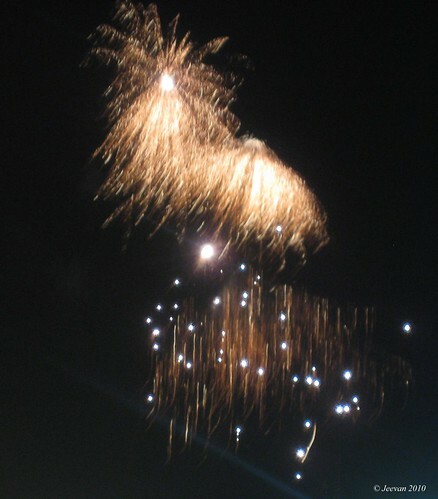 Not every wish get exist or completed! So wish to have pets quite depends on situation and its unfavorable for a family alike us, that’s not well enough to support a life physical and someone who’s truly depend on their parents who can’t sustain much. More than thinking about myself I always think about others and never what to give any trouble to anybody, but still I can’t bear it since I’m supported by someone, which might cause trouble to them. Again I like to say, having pets isn’t wrong and those love to have pets should think a lot and discuss with others such as house members, neighbors (if those in apartment should think serious about the crisis and almost try to avoid having pets) and close relations those visit often. I think those go for dogs aboard or the fair ones are particularly just for show and those who are totally in love and passion for dogs could easily go on anything from country dogs. I wonder how many of them still have and go for the famous country breed Rajapalaiam! This is something shows people are more interested on fair breeds, and I don’t say it is wrong, but seeing dogs as a display dolls and just for amusement alone should change and if we treat and feed dogs rightly they are our best friends and if we train properly they are our lifesavers. The intention of having dogs should be love and reliable and not causing trouble! 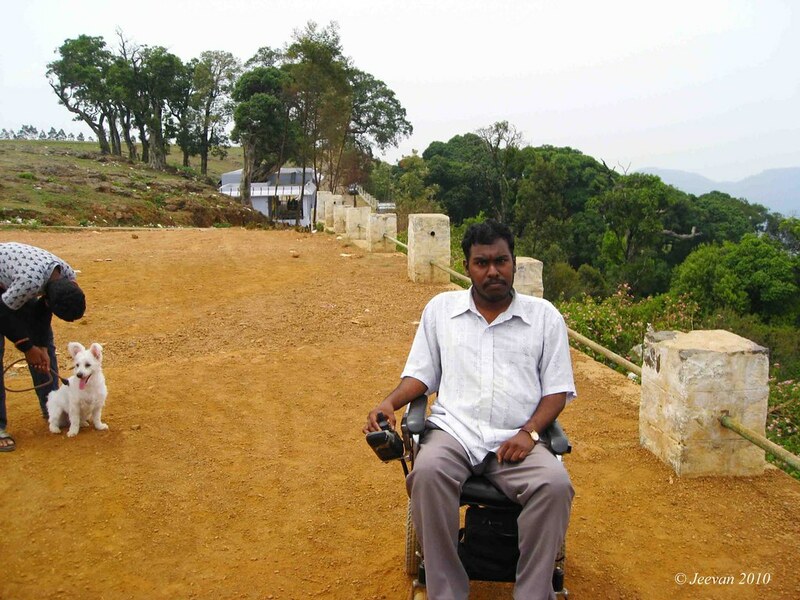 The Servarayan hill’s of yercaud is a feel so good place that lifts spirit in the air! The cool breezy atmosphere attracts many visitors to this peak – the highest elevation of the yercaud, which welcomes throughout the year for a quite relaxing vacation. The spacious servoroyan hill has a pleasant view of green mounds and unspoiled valleys with very fewer concrete structures to exist and it was little hazy when we arrive in morning. The uphill road has several tall trees to somewhere conceal the sky with certain long standing in history. 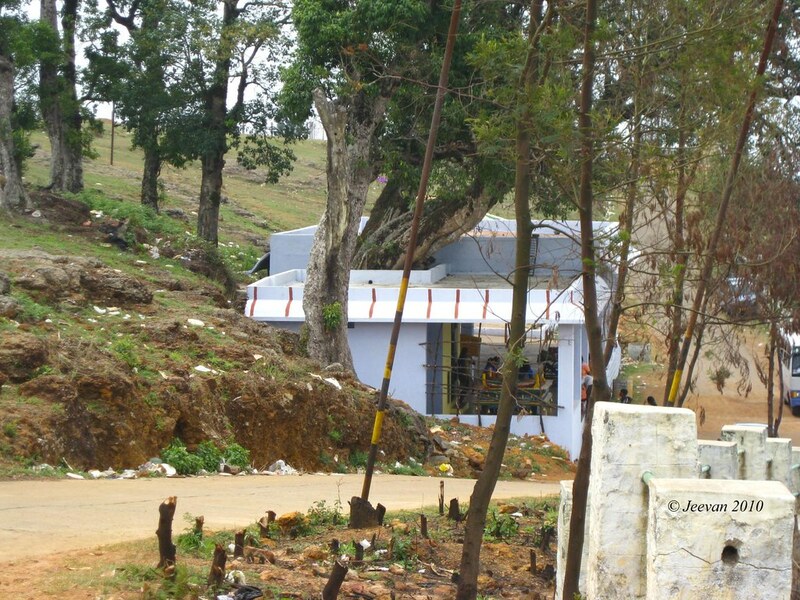 The Servarayan hill is noted for Servarayan temple, where the Lord Servarayan resides with his consort Kaveri inside a narrow dark cave. The cave is believed to extend up to 480 km leading Kaveri in Karnataka, which connects the Hill with River Cauvery. The cave is also believed to be explored by very few and some saints to travel fully; which is pitch dark with no ventilation and snakes movement after certain distance. The Tipu Sultan was also supposed to use this Bear cave as a hideout and secret route to escape at the time of war. The Servarayan hill has couple of viewpoints to enjoy the green valley and to entertain children; there was a swing and giant wheel to cause a sense of floating in the air. 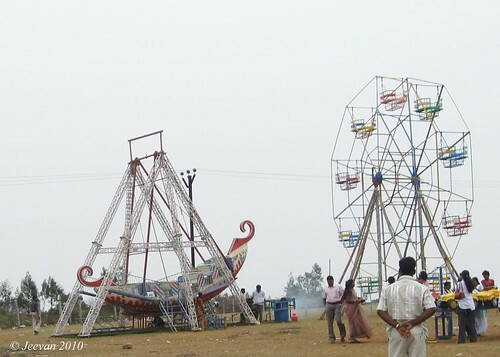 I wish I was a child to enjoy the swing to the moving wind and little above the sky to wonder how cloud nine. 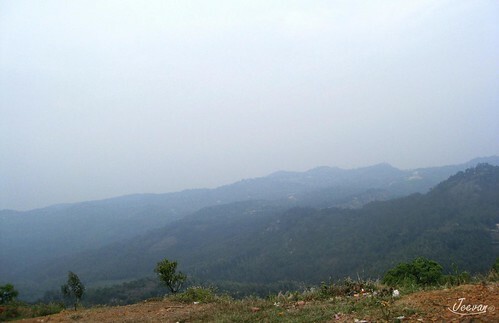 We spent there some time breathing the fresh air and feeling the cool atmosphere and having few spicy mango slices. It was a day went without hurry and we took our own time to relief ourselves from the strong toxic and carbon emission that we unveil to. We had a brief movement around the wide peak, watching down the valley and the far away bauxite mine that looks like a land on mars. 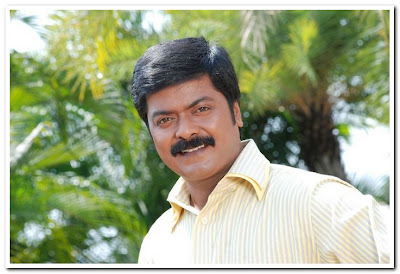 I truly mourn to those who miss him deeply and struggle to get console from his sudden loss of life. 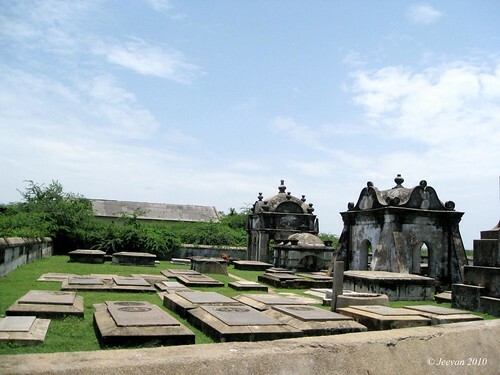 The Dutch Cemetery in Pulicat dating back to 16th century, near the market place is an interesting landmark of Dutch foot in pulicat, built in between 1606 to 1690 with 76 tombs and mausoleums. The beautifully carved tombstones with inscriptions in the Dutch language are said to have been carved in Holland and sent to India. The sign board at the entrance says ‘the monument has been declared as National Importance and those cause damage to the monument shale be punished. 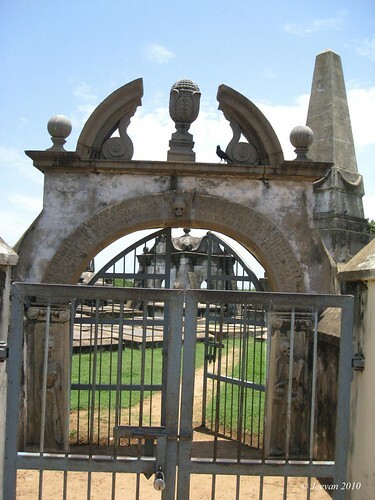 The Dutch cemetery is protected by Archaeological survey of India. The cemetery was locked by the time we visit, but the inner gate was opened and those who take risk could jump in. The two skeletons sculpture at each end of the entrance looks interesting with a designer arch inscribed in Dutch. The tombs and mausoleums inside the cemetery could be glanced almost look out from the compound wall. 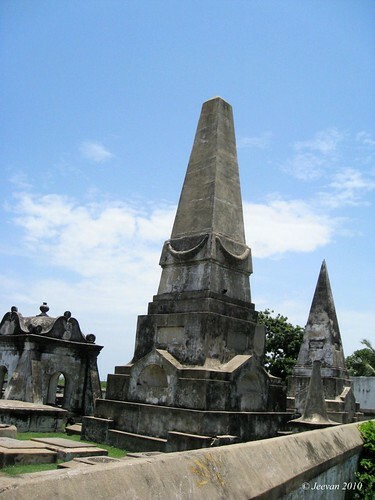 History tells that the Dutch Fort Geldrian, which is opposite to the Cemetery, is the place from where Dutch trading with the East Indies. It’s fun watching this ad promoting the zuari cement! A very nice creativity and interesting in form. 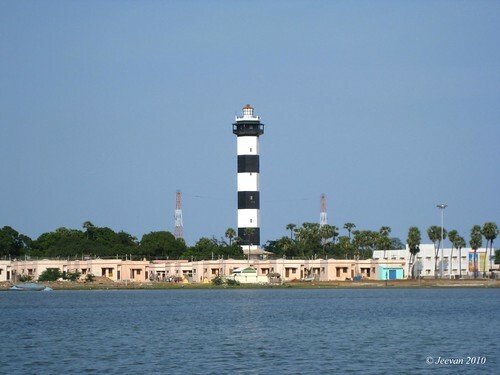 Few weeks back we went to Pulicat, which is about 75kms from my home and 60kms from Chennai toward North. 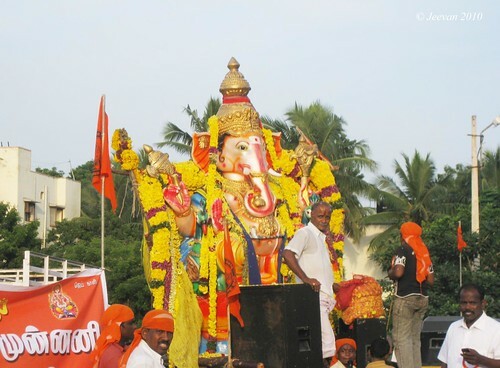 It was a sunny Sunday and we get ready early for the journey and the ride went through marina, kasimedu, minjue, kaattur and pulicat and the route were new to us after kasimedu – Chennai fishing harbor. The north Chennai which always seems crowded and dusty isn’t different, and the day being uncertain about the lorry strike announced to protest against the diesel price rise, the tankers that were suppose to enter harbor were parked a lot along the way and across kasimedu, turned the way into single and the road work going at some places delayed our drive to pulicat. 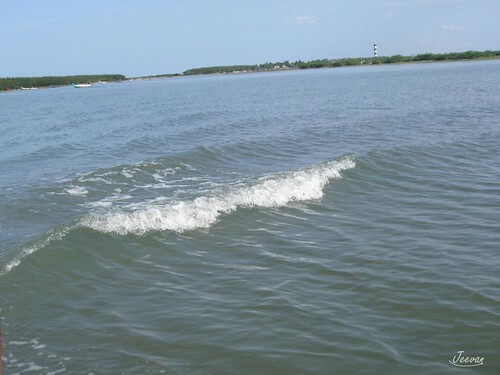 Pulicat is a huge lake shares the border of state Andhra Pradesh and Tamil Nadu, which is also known as Pazhaverkadu, a fishing village located within Tamil Nadu. 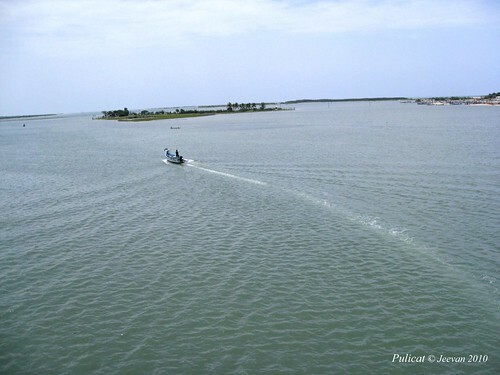 Pulicat is the one and second largest brackish-water eco-system in India, next to Orissa’s Chilka Lake. 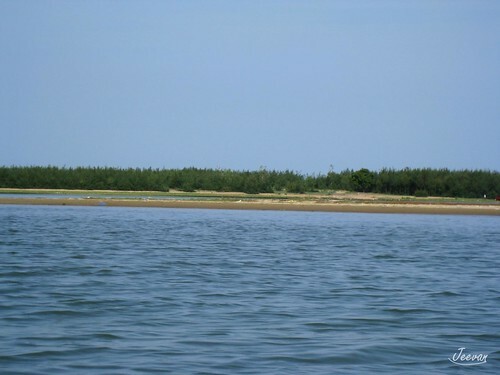 Pulicat is also a lake bird sanctuary, and many birds migrate here overseas by winter and the famous greater flamingos are sighting here. 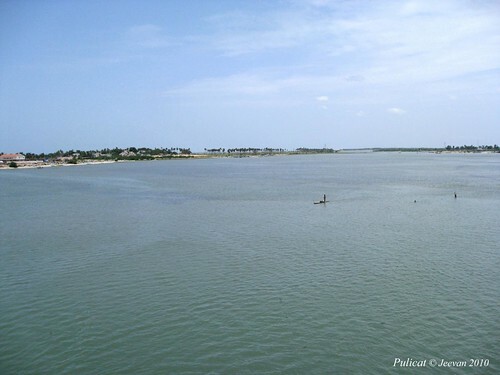 Pulicat, having a history back to 1st century, where it was mentioned as one of the ports on the east cost of India, has the arrival of Portuguese in 15th century and followed by the Dutch. The Dutch came here as there ships got struck on the shores, from where the coast line got the name Coramandal, still bears the evidence of the Dutch’s existence through the ruins of Fort Geldria built by the Dutch and a easy view of a Dutch Church and Cemetery. 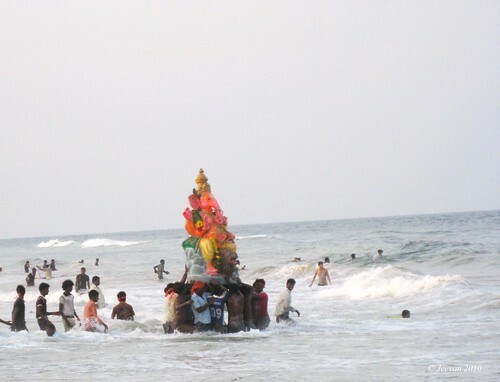 During those periods, Pulicat was known by the name pallaicatta. 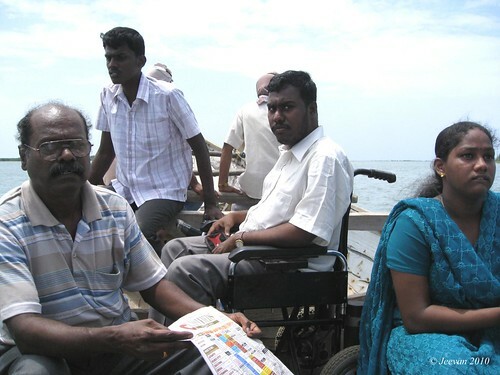 It was noon by the time we arrived pulicat and as soon we enter the village, many people stop our vehicle for boat ride. Keeping away those request, except a guy who talked in hope and caused to support us to the island through a boat ride, we moved across the new bridge before hire his boat. 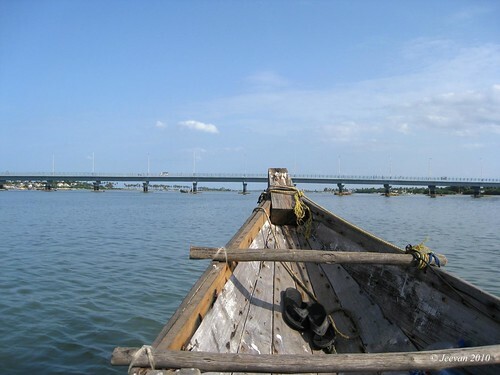 The bridge was newly built to connect the Island village with transport which were until then occurred by boats and bullock cart – when the water level is low. 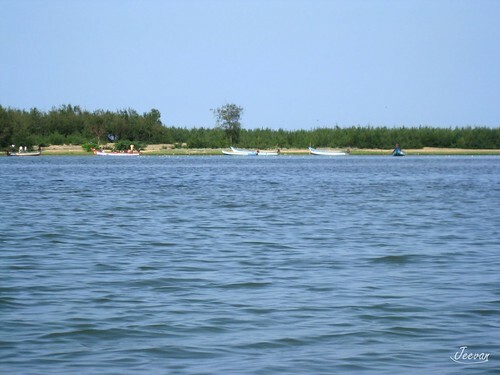 The Pulicat Lake is a merging point for three major rivers and small streams, including the Buckingham canal, which is part of the lagoon on its western side. 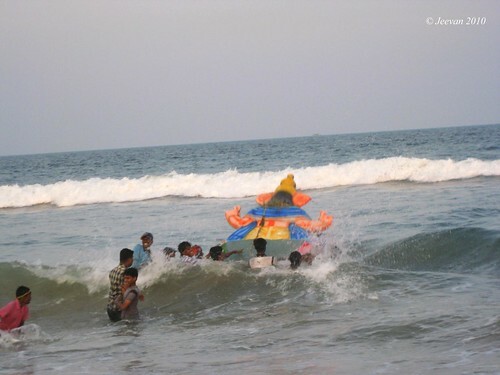 The lagoon’s water exchange with the Bay of Bengal is through an inlet channel at the north end of Sriharikota – where the Indian space rockets are launched – and out flow channel at its southern end with 200 meters wide, and the rise and depth is depend on the flow. There isn’t anything to see other than the Old Lighthouse, on the island village across the bridge, which is sighted from everywhere and even far away. It was a wonderful view from the bridge, with a panoramic of both sides of the lake, and besides seeing a small island away, and a boat with a box perhaps fishes passed away. We were back to the jetty, where our boat man waited for us and the place doesn’t look clean and hygiene, and what can we expect from a place where the boats unload the fishes caught from the lake and seas. After a task we climbed the boat, which is an old one made in woods than the many colorful fiber boats. The boat man helped my parents and cousin to assist me into the boat, and without them I can’t enjoyed the ride. The boat ride takes about 25 minutes to reach the island, where everyone suppose to visit and spent time with families and friends. The casuarinas groves in the island provides a nice shelter to everyone from the scorching sunshine and people who comes with gas stoves, cook meals and have fun with there families. While we arrive, there were a group of guys having fun with there friends by dancing, singings and making noise. On the way we saw three pelicans swam in the lake at a certain distance to one another and it was late noon while we had our lunch that we brought from home, except the spicy prawns cooked by grandma, which were caught from the lake by then. It was very hot weather that day and we can’t head out of the casuarinas groves we land on. The boats stops by and moves, people flow in and out, the boats resound every minute and then, disturbing the peace which is the cause they say about birds keeping away from the sight. It was time to return back and the sun was there still scorching about even it was evening, forcing its rays into the soft skin. The island was green enough with grasses grown everywhere to attract and the waters are clean to see the sand inside, and a nice place to take cool bath against sunshine. The ride was very pleasant while returning back, except the hot sunshine, the blue skies and water reflects beautiful with mild ripples waves that calm the moment, but though excite to see a lonely greater flamingo flying overhead to surprise. The boat ride took a long way while return back and the dept of water at these places are said to be more than a man’s height and we saw a fisher men just waking in the middle of the lagoon lake, with water up to his neck and he was planting sticks and nets to catch prawns. As we unload ourselves from the boat, the water level had raised down little to land us on the unclean terrain, where two women washing fishes beside. It is nice to spend a day different by taking a boat and having picnic in an island and watching birds – which is something, disappoint me and I wish to visit Pulicat in winters to sight greater flamingos. I think now it would be nice if we taken a boat from the island village which has better and clean jetty or visiting the Tamil Nadu Boat House for a decent boat ride we failed to check. This time we tried the NH 5 to return home, to avoid the containers trouble in north Chennai. The road link the pulicat and NH5 is simple nice, as it passes through villages and fields giving a sense of freshness in absence of much vehicles. My cousin who is on wheels in his early stage drew back home safely, saving a goat and small puppy which were in there own world across the road. I wish I get a good companion soon in him to drive me everywhere, without waiting for dad or a driver.